Digital networking is creating new forms of collaboration, even in small and medium sized companies. More and more managers, team leaders and employees are working in different locations rather than centrally. How can they succeed together? The magic formula is: virtual teams. But they need competent digital management. You can achieve that using the following seven tips. “The human factor remains the greatest hurdle for global virtual teams.” That is the key conclusion of a study entitled “2018 Trends in High-Performing: Global Virtual Teams”. For virtual teams to work successfully, it matters less whether one person is sitting in Brussels, one in London, two in Vienna and five in Warsaw; what’s important is how the work is organised, and how expertly the various people go about their work – and with how much team spirit. For the fifth time running, international consultancy RW3 Culturewizard surveyed managers from 90 different countries for its Global Virtual Teamwork Survey. 1,620 managers responded by sharing their experience in projects, virtual teamwork and team management. The study’s most important finding was that despite new technologies and digital transformation, it is the people involved who retain the biggest influence on the quality of collaboration. Online meetings involve particular challenges for everyone involved. Sitting together around a conference table, having eye contact, talking to each other and having the occasional laugh: traditional forms of being together, which working teams have always known, are no longer a matter of course. Instead, more and more people are meeting in online rooms. If you ask about the difference, 84% will say that virtual communication is more difficult than personal, and 89% will also state that participants come from at least two different cultures. Cultural differences, problems with language and understanding and different time zones all need to be managed well. So it is surprising that only around a fifth of those asked had undergone training to make collaboration more successful. International businesses and global markets are becoming more and more important, but daily working practice shows that the ability to work well together is not automatically keeping up. The following seven tips will help you to manage virtual teams sustainably and successfully. Successful navigation and communication within a team is crucial to ensure that everyone is working towards a common aim and achieving good results together. The study shows that traditional face-to-face meetings are still considered best by 52% of respondents. So as a team manager, you need to consider how you can transfer the benefits people experience when present together, into a virtual space. Telephone conversations are still considered beneficial by 27% of people, and video conferences by 34%, whereas conventional emails enjoy much less popularity at just 14%. For work to succeed, you have to carefully monitor the quality of communication if you are in charge. For instance, you need to make sure that working processes are transparent and clear to everyone and that important information is regularly and reliably passed on. It is also advisable to improve efficiency where required using targeted activities, because the study shows that virtual collaboration does not succeed automatically. Collaborating across different companies and locations requires competent leadership. It is essential that team managers and members trust each other. Do members have enough actual experience to demonstrate that collaboration will involve trust and appreciation despite the distance between them? Harvard Business School Professor Frances Frei provides a crash-course in trust-building in her 2018 TED Talk. She explains how to create and sustain trust using authenticity, logic and empathy. Frei was senior vice president for management and strategy at Uber. The 2018 Virtual Teamwork Study also asked what it is that makes a good virtual team member. “He who wants good must first be good,” said Goethe. Nothing has changed when it comes to the importance of role models. As a manager, decision-maker or team leader, you have to set a good example. Make it clear that you value good virtual collaboration. This will be especially credible if you yourself know your way around online meeting rooms. If you still don’t, be curious. Take it as a personal challenge to acquire a high degree of expertise. Tip 4: Create a common opportunity to learn. 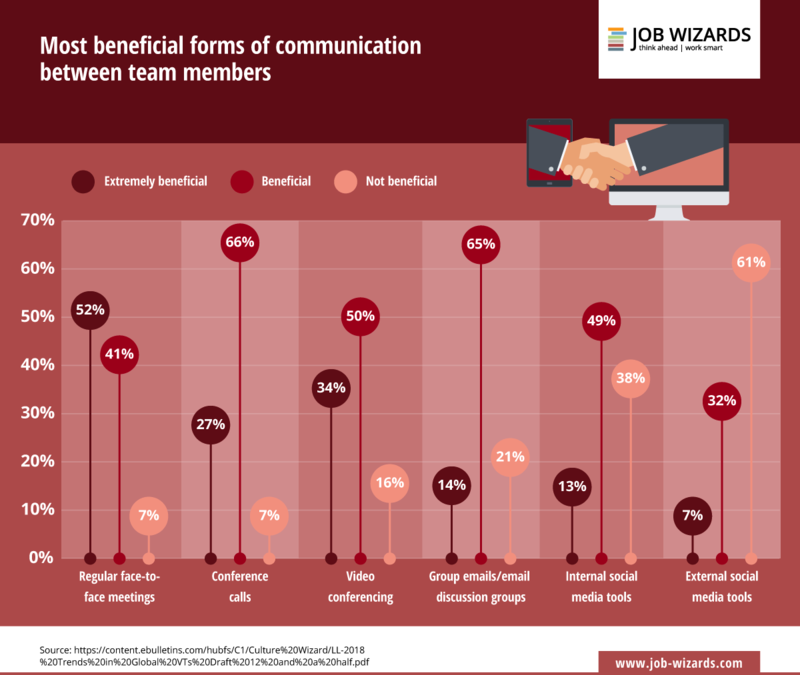 Working in virtual teams is especially fruitful if you manage to get all of the team members on board, together with their different expertises. Place emphasis on a positive atmosphere in which everyone is used to contributing. Create clear, transparent working structures in which their contributions can be seen and colleagues can give feedback. 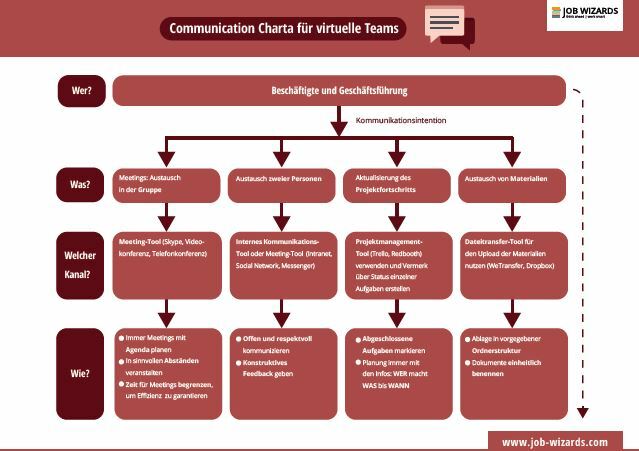 For example, you can do this using a common dashboard or a mutual communication charta on which everyone in the team has agreed. The charta might include things like the way joint scheduling and document filing work. This also makes it easier to collaborate across different time zones. Virtual teamwork, like any other kind of work, requires intelligent, expert management. If you and your staff are relatively new to it, then building up and developing the team will be at the top of the agenda. 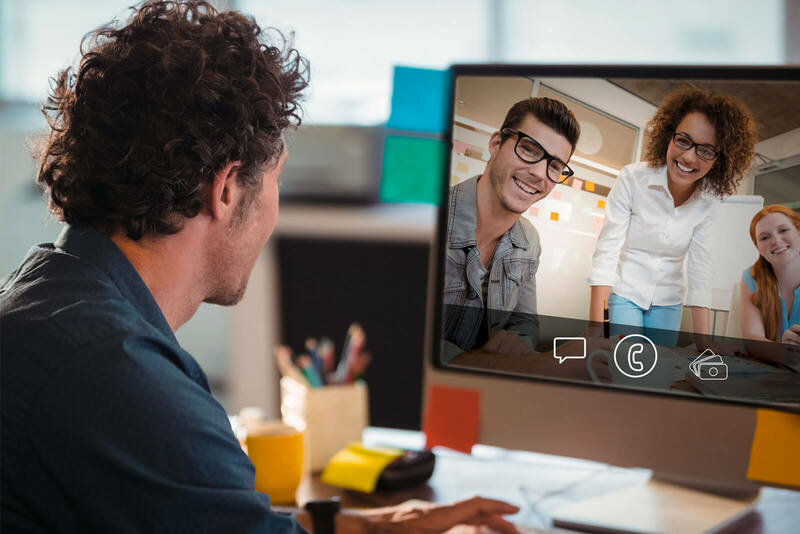 You can plan and execute your first virtual meetings using tools like Skype for Business, Cisco Webex Teams, GoToMeeting, vitero and Adobe Connect. There are various online solutions, called collaboration tools, which make it easier for team members to cooperate in different locations. 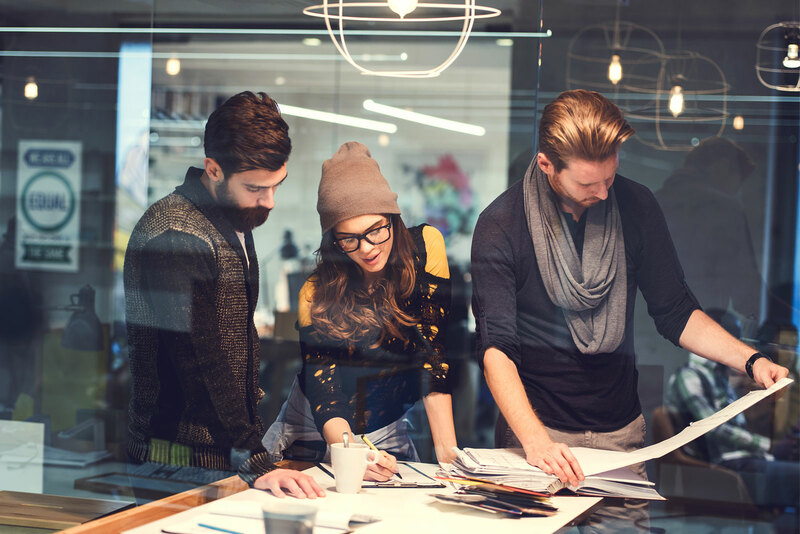 The Institut für Arbeitsdesign und Zukunftstechnologien e.V., or ifaz for short, an organisation for workplace design and future technologies, has examined and evaluated ten such tools. An informative blog article and Excel table summarise their findings. They conclude: “Despite similar features, the collaboration tools we analysed are all very different, and each has different strengths.” They recommend trying out the tools and analysing all of the main collaboration processes very carefully. Only then will you find the tool you really need. 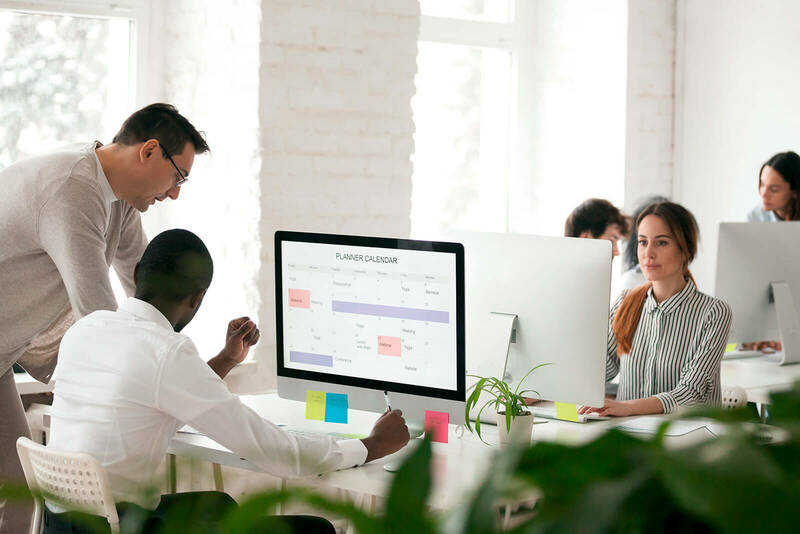 Whether you’re engaging in ‘conventional’ daily work, work at a home office or new challenges – or an important kick-off meeting or first international project – get together with your team to draw up clear objectives and requirements for their daily working processes. What tasks need tackling? Who has to do which actual working process, and by when? Who will help whom with which task? You should also create regular feedback loops to ensure that shared objectives remain present. Tip 7: Management at a distance needs clear rules and clear scheduling. Effective online meetings – much more can be achieved! Personal meetings are being replaced by virtual ones in more and more companies, but online conferences and jour fixe arrangements in online meeting rooms are often regarded as irksome and time-consuming. 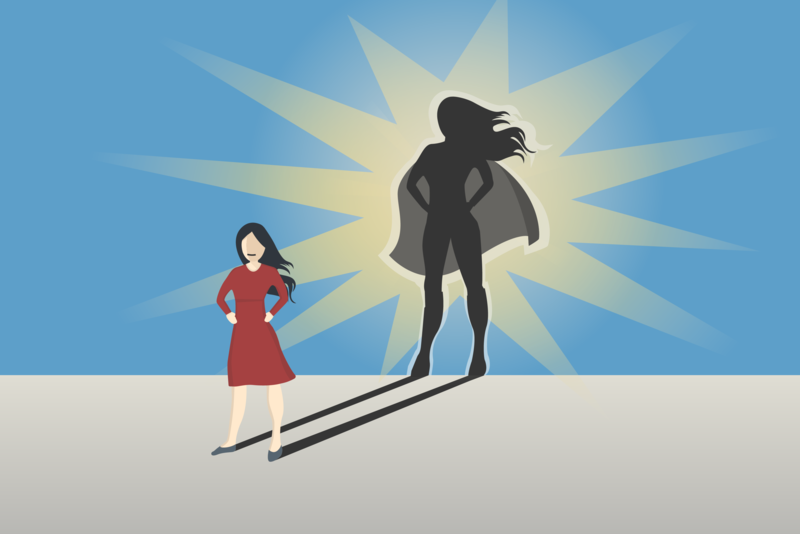 Alexandra Altmann, a business psychologist and expert in virtual collaboration, explains why.